Lindsey Pulliam rises up for a shot. The freshman guard played 39 minutes and scored 11 points against Iowa. Over the past week, Northwestern has played three games, has lost all three and has played only eight players in all three games. That lack of depth held the Wildcats back Sunday, as they struggled to keep up in a fast-paced, high-scoring battle against Iowa in Evanston. NU’s seventh straight loss, this one by a score of 70-61, really got away from the Cats (9-17, 2-10 Big Ten) late in the first half, when Iowa ripped off a 16-2 run to take a 14-point lead into halftime. Foul trouble was a major problem for NU on the day. With freshman guard Jordan Hamilton and junior forward Pallas Kunaiyi-Akpanah each picking up their second fouls during that stretch, sophomores Abbie Wolf and Byrdy Galernik were thrust into the lineup for significant stretches. The duo combined for 12 points on 4-of-7 shooting, filling in ably on the offensive end but struggling to contain the Hawkeyes’ attack. Constantly on the floor were freshman guard Lindsey Pulliam and sophomore forward Abi Scheid. Scheid played all 40 minutes Sunday, while Pulliam played 39. Both players average at least 36 minutes per game in conference play, and neither has sat more than two minutes in any of the previous three games. McKeown has been forced to deploy his starters for heavy minutes due to several injuries and departures from the program. Senior guard Lydia Rohde has missed time with an upper-body injury, freshman Lauryn Satterwhite is out for the year with a lower-body injury and would-be junior forward Amber Jamison took a leave of absence from the program. With a short bench and the starters dealing with a heavy workload, the Cats struggled to keep pace with the Hawkeyes’ attack. In the fast-paced first half, the hosts committed nine turnovers — including a careless inbounds pass that led to a wide open Iowa layup — and struggled to stop Iowa, which shot over 55 percent from the field. The Hawkeyes didn’t let up in the last two quarters either, shooting almost 60 percent from the field. Star forward Megan Gustafson, who leads the Big Ten in scoring, poured in 14 points and made all six of her shots from the field. 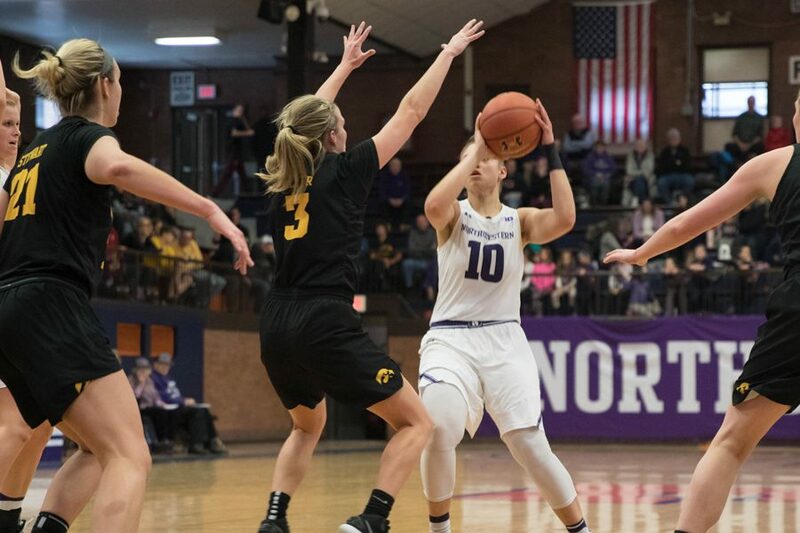 While Kunaiyi-Akpanah was able to keep NU within striking distance, scoring 12 points of her own after the break, Scheid and Pulliam struggled in the second half, making only four of their 13 combined shot attempts.